Among the most long-lived styles of American building. The Georgian style was named after the English Kings George I, II, & III whose ruling periods were from 1714 - 1820. During their reigns in England the colonies became prosperous, the social classes developed, and style mattered. 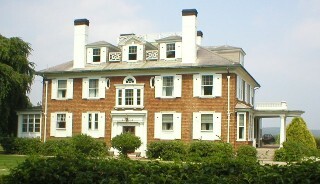 Stately and symmetrical, the colonists homes imitated the larger, more elaborate Georgian homes which were being built in England.This style was popular in the British colonies from Maine to Virginia. Georgian homes were built of wood or brick depending on materials locally available. These Georgian-style homes were highly symmetrical with multi-pane windows evenly balanced on each side of a central front door, pedimented dormers, pedimented windows, and quoints at the corners. After 1750, additional elaborations would include a roof balustrade, a centered front gable or pediment, a shallow projecting central facade, and two story pediments. Renaissance-inspired classical symmetry. A square, symmetrical shape. A paneled front door that is centered in the face of the home and capped by an elaborate decorative crown, supported by decorative flat pilasters. A row of small rectangular panes of glass beneath the crown, either within the door or in a transon just above, and decorative flat pilasters. A Minimal roof overhang and the cornice usually emphasized by decorative moldings, most commonly with dentils. Windows with double-hung sashes having many small panes aligned horizontally and vertically in symmetrical rows, usually ranked in five across the front, although smaller homes might only have three windows across. Georgian ideals came to New England via 'pattern books', and although America's Georgian homes tended to be less ornate than those found in Britain, the Georgian styling became a favorite of well-to-do colonists and were the most elaborate residential structures built in the colonies during the 18th Century. More humble dwellings also took on characteristics of the Georgian style. The hipped roof was the British Georgian and the gable sided roof is considered the American Georgian. The "half Georgian" consisted of one "side" of a full Georgian, popular for row houses on urban lots . Single-story Georgians also exist, often referred to as "Capes" or "Cape Cods". It is sometimes difficult to identify a building as either Georgian or Federal. Roughly, any homes built after 1780, with a Palladian window and/or elliptical fanlight over the door, would be considered Federal style.